As NAACP Interim National Education Director, he has led the NAACP’s work in understanding the Every Student Succeeds Act (ESSA) and civil rights, in working with units to engage states as they develop their State ESSA Plans, in advocating for strong federal oversight, and now in working with units to monitor and engage school systems as they begin to implement those plans. Victor developed the ESSA Toolkit for NAACP units and a sample letter for units to push back against Trump’s Proposed 2018 Education Budget. He has also provided staff support around NAACP opposition to the privatization of public education and worked closely with NAACP members across the country in their education equity advocacy. Victor has asked that all State and Area NAACP Conference unit Education Committees, in conjunction with Political Action, conduct at least one Voter Registration event per month for the next 6 months. He serves as Baltimore County NAACP co-counsel in its civil rights administrative complaint to HUD against Baltimore County (settled in 2016). As part of the remedy the County will provide subsidized housing assistance in high opportunity areas, one indicator of which is good schools. Victor also represented the MD State Conference NAACP in its challenge to the State of Maryland’s failure to provide all juvenile detainees all of the education services to which they are entitled. In response, Gov. Hogan added $3 million to the 2017 State juvenile detention education budget. 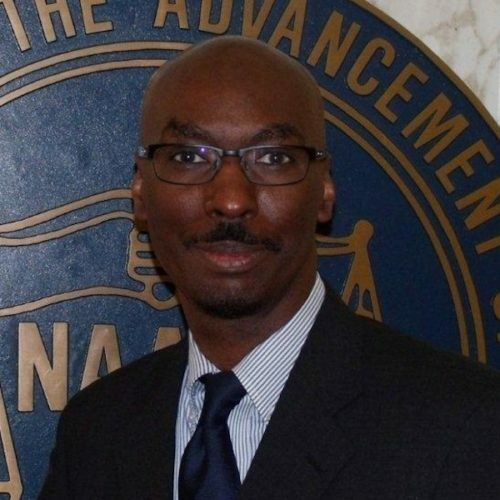 Licensed in Texas and Ohio, Victor is an NAACP Assistant General Counsel on detail to Education. He has represented the Association’s interests in: education, voting rights, public accommodations, advertising industry, criminal justice, environmental, fair housing, as well as in-house matters. He was Manager of the NAACP National Redistricting Project and a recipient of the Medgar Evers Award, the national NAACP top staff award. He was previously Legal Redress chair for TX State Conference NAACP, Austin NAACP and Toledo NAACP. Victor successfully defended the right of an NAACP leader, who worked for the IRS, not to have to choose between his job and his volunteer work in the absence of a conflict, and the NAACP’s right to conduct a third party direct mail voter registration campaign in VA. He worked with the branch and the State to get a LA district to reinstate a 9-year old homeless girl wrongfully kicked out. As a Legal Aid attorney, he was lead counsel in a statewide class action on behalf of Food Stamp recipients whose primary language is Spanish (settled); helped get a district to pass its first antiracist, multicultural education policy; worked with another district to re-evaluate its policies on student race and gender harassment and equal educational opportunity. The school board revised all of its policies & sent teachers & administrators to trainings/in-service on diversity/dealing with racism. Victor negotiated first time agreements with a school district to provide Vietnamese translator for student preparing for state proficiency exams and with County mental health providers to provide interpreter to Vietnamese clients. Pro bono: with co-counsel obtained state court injunction against district in high-stakes testing case (about 80 seniors allowed to participate in graduation ceremonies in district high schools); developed customized databases from public records requests, analyzed data, and with research partner Dr. Jennifer Goode published studies on the Toledo Safe Schools Ordinance; in response to a radio shock jock calling Toledo branch president and broadcasting their conversation without warning her, Vic filed a complaint on behalf of branch with the FCC against the radio station (FCC imposed fine on station owner). He used administrative complaints to obtain systemic relief in education & health care cases. E.g., filed first disability discrimination claim with OCR against an Ohio charter school (settled), racial harassment claim against Toledo Public Schools (settled), bilingual access claim against a community health clinic system (settled), claim against Toledo Public Schools for failure to ensure properly certified special education teachers (favorable ruling from Ohio Dept. of Education), bilingual access claims with HHS against Head Start Program (settled) & City/County Health Department (settled), national origin & gender harassment claim against a rural school district (lost on merits but settlement included relief we sought originally).